Well I’m here to answer these burning questions! Detoxification is about cleaning your body of all the “junk” that has accumulated over the years. Just as we do spring cleaning for the house, it’s important to do the same for the body. Everybody’s body is unique and so are the clearing rates at which the detoxification organs (skin, lungs, kidneys, liver, intestines, and lymphatic system) remove various toxins that have built up in the body. Unfortunately, we live in a toxic world. We’re frequently exposed to environmental toxins such as industrial pollutants, chemical pesticides, pathogenic bacteria, certain prescription antibiotics and over-the-counter medications, and even excesses of certain foods. If the eliminatory organs aren’t functioning properly, toxins are left with no place to go and remain inside the body. This, in turn, can lead to progression or development of disease. That’s where a detox can come in. Think of it as giving your eliminatory organs a much deserved break from the burden that is put on them on a daily basis. Low energy levels, skin conditions such as eczema, gas and bloating, PMS, irritable moods, and sweet cravings can all be symptoms of toxic build up in the body. If you experience any of these, a little spring cleaning might be what you need. So, what does a detox consist of? Well, for the extreme few individuals, it consists of fasting or colonics. However, for the rest of us, it can be as simple as eating whole foods (i.e. foods that don’t come packaged), drinking more water, exercising, and perhaps supplementing with specific vitamins or herbs to aid the body in eliminating toxins. Avoiding processed foods, sugars or artificial sweeteners, and saturated fats and substituting those with whole foods is a great way to start your detox. Eating fresh fruits, vegetables, and whole grains provides much needed nutrients and fiber that helps improve digestion as well as improve elimination through the liver and kidneys. Saunas, hot yoga, or anything that works up a sweat will also help your body detox through the skin. Want to help your lymphatic system with removing toxins? Try massage therapy or contrast showers! At the end of your shower, do a few cycles of alternating hot and cold: 1 minute hot, 10 seconds cold, always ending on cold. This is a great way to help with lymphatic circulation through the body. If you aren’t feeling the absolute best that you can feel, taking some time to improve how your body is eliminating toxins may be worth the effort. In the end, you will feel more energized and rejuvenated; after all, isn’t that what spring is all about? Drink plenty of water (at least 8 glasses/day). 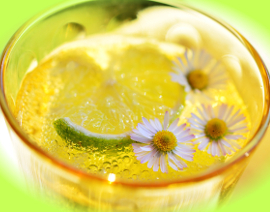 Add half a lemon to a warm glass of water and enjoy it first thing in the morning. This is a great way to help stimulate your liver to aid in detoxification. Eat your salads and greens – they provide you with lots and lots of live enzymes and minerals and also help detoxify heavy metals from the blood. Exercise regularly, for at least 20 minutes – Partner up with a friend or family member if motivation is a problem. Go for a brisk walk or jog, or try something different like a spinning class or Yoga! Next, see the best foods that help detox the body!